After a long career which has included second and third places in 2012 and 2013, Germany's Timo Bracht added the prestigious DATEV Challenge Roth title to his extensive CV today, by running down Nils Frommhold (GER) in the late stages of the marathon. 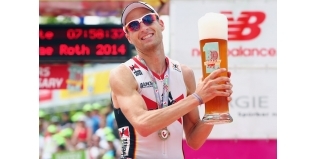 His 7:56:00 finish time is also a personal best, improving on the 7:59:15 he did when winning the Ironman European Championships, Frankfurt in 2009. He therefore joins a select group to have two or more entries on on the all-time Sub-8 listing. “I dreamed ten years to win this race, the whole day has been very emotional the crowd were amazing when I felt down they brought me back,” said Bracht. “It was a fantastic day you need that day to win big races and today I brought it all to the race course,” he said. “But dreaming along doesn’t work and the will to go was the key to success today,” said Bracht. Frommhold was thrilled with his second place and Llanos won the battle for the final podium spot. “On the bike I wanted to show them what I got. And it went even better than planed,” said Frommhold. “I've given it my all, but in the end it wasn't enough. I'll definitely be back, because this was an incredible event,” said Frommhold.